I was invited to join a creative design team of Canadian company – Studio Katia. 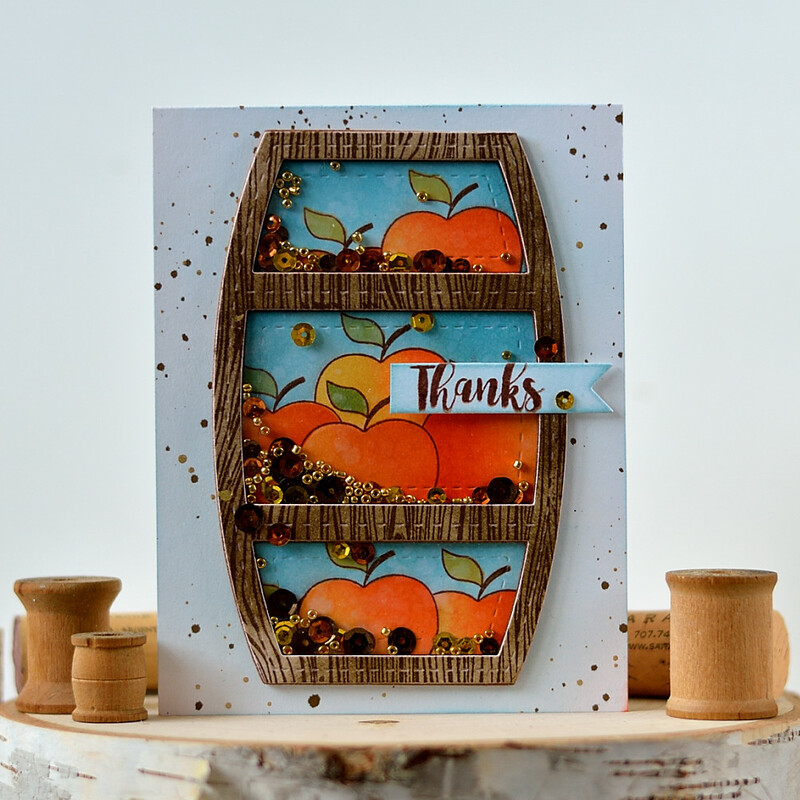 And today I want to share a card, made using some supplies you can find in store now and some will be released the next week. 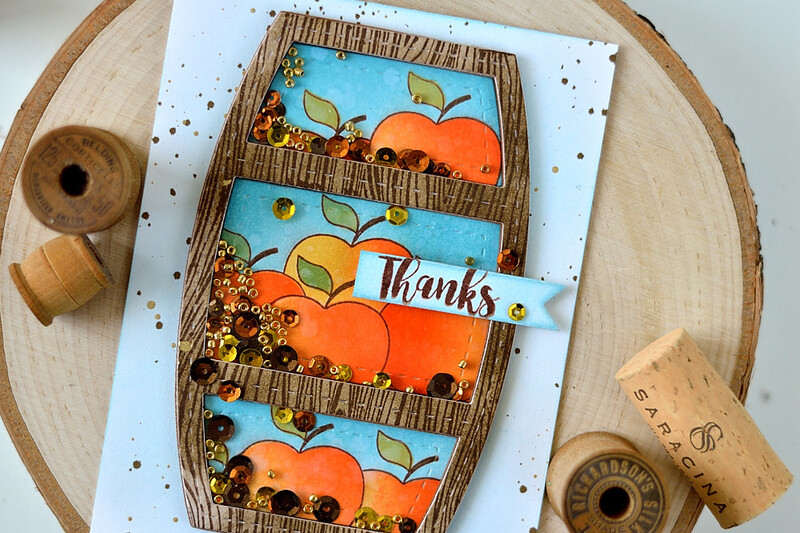 I made a fall and fruitful card, using Stitched Creative Window die and new Teacher’s Apple stamp set. The idea was to picture some kind of storage of apple harvest. The shape of this die remind me shelving unit 😉 First on three pieces of white cardstock I traced the die-cut inside parts to know the borders I needed to keep my stamping in. I could just die-cut them and use for stamping. But these die-cuts have stitching and I wanted all stamping and inking to happen before, or kind of under this stitching. When all distress coloring was finished I sprayed these pieces with water, using Tim Holtz Distress Sprayer. Distresses reacted with water, adding some texture and interest to otherwise flat background. Then I started assembling the shaker. First the dimensional part was die-cut using the same die out of brown sticky back foam. This foam has adhesive on one side and I needed both sides to be sticky. So I applied Stick-It piece onto another side before die-cutting. Stick-It is very thin adhesive. 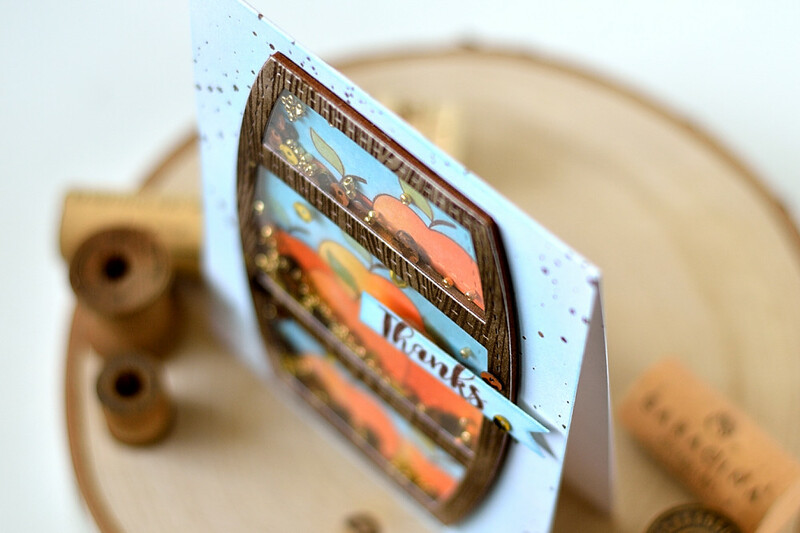 It almost doesn’t add any bulk and it’s safe to use it with die-cutting machine. I adhered the foam die-cut to an A2 top folded card I cut and scored using Neenah Solar White cardstock. Next I inserted inside pieces it their corresponding negative spaces. Added sequins from Autumn mix and some Gold Foil Seed Beads. After that I cut out a plastic piece using my scissors and adhered it to the foam die-cut, followed by adhering the top die-cut (with woodgrain design) on the plastic using Ranger Glossy Accents glue. 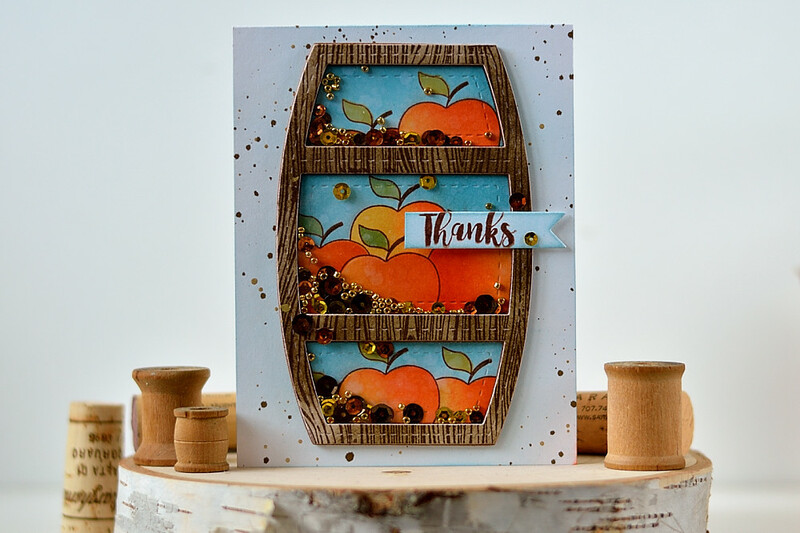 So here you have it – an apple harvest storage unit 😉 Hope you like my card and haver a great day!